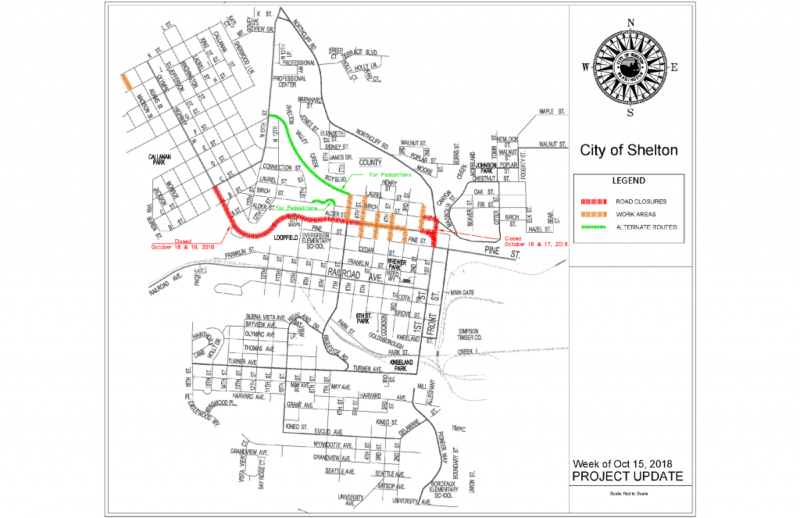 Crews continue working on infrastructure improvement projects in Shelton that are impacting traffic around the City. This construction includes the Downtown Connector Project and the Basin 3 Sewer Rehabilitation Project. As a reminder, there are several temporary traffic revisions and lane closures in effect in the downtown area. Traffic revisions mentioned in this update are subject to change without notice, and may not include all potential revisions and/or lane closures that could be implemented. Here are where crews are working October 15th to October 19th. Olympic Hwy North will be closed between C St. and 7th St. on Thursday and Friday (Oct. 18& 19) during work hours. Alder will be closed between 1st St. and 2nd St., and 6th St. and 7th St.
Northcliff Road will be inaccessible on Tuesday and Wednesday (Oct. 16 & 17). Local access only between Birch St. and Poplar St.
1 St. will be closed between Birch St. and Pine St. on Tuesday and Wednesday (Oct. 16 & 17). 1st. St between Birch St. and Pine St.
Birch St. between 1st St. and 2nd St.
6th St. and 7th St. between Alder St. and Laurel St.